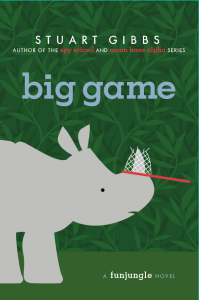 Big Gam e, by Stuart Gibbs is full of suspense, action, and excitement. When a poacher attempts to shoot Rhonda, an endangered white rhinoceros that is about to give birth, Teddy was there to stop him. Teddys parents work at Funjungle, a very large zoo, and Teddy is always there to help. When someone tries to take a shot at Rhonda,Teddy wants to get involved but his parents don’t want him to be a part of it, because they don’t want him to get hurt. last time he tried to help he almost died because a poacher saw Teddy while he was taking the koala. The conflict in this book is that poaching is very illegale. Poaching can cause the extinction of an animal. If one were a person that enjoys suspense and action then this book is a great choice. This page turner is full of action and impossible put down. Every chapter is introduced with a sentence that encourages us to read more. This is an example of what Stuart Gibbs does at the beginning of a paragraph, McCracken wasn’t the kind of person you could say no to.” This is in dark black so that means that this is a new chapter. I think that this book is one of my favorite books.